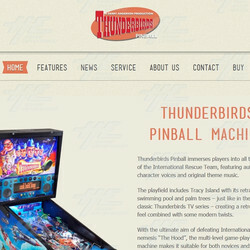 A website dedicated to the Thunderbirds Pinball machine by Homepin is now live. It contains information on all things Thunderbirds Pinball related, including servicing, news, features, where to buy and contact information. The Features section lists the electronic features, cabinet features and Thunderbirds specific features contained within the machine including the fully-operational Tracey Island with slow sliding pool and the realistic slow action Thunderbird Two ramp. Thunderbirds also includes shaking trees to mimic the action when Thunderbird Two is launched. The Features section contains videos of these features in action. The Service section contains links to get Thunderbirds Pinball spare parts, as well as manuals, troubleshooting and warranty information. However, in order to access the manuals, customers need to own a Thunderbirds Pinball machine and be a member of Highway Gaming. The Buy section contains information on international and local distributors including contact details and where they are located. The News section contains the latest news regarding Thunderbirds Pinball, while the About Us section provides the viewer with information about Highway Games and Homepin.